SRCE Education Week Award Recipients Donna Lameman, Chelsea MacCuspic, Lorraine Reddick, Annamarie Talbot and Ann Whalley (seated); Sharon MacCuspic, Director of Programs and Student Services; Janice Gough, Director of Human Resources; Award Recipients Julie Jean, Janice DeGruchy, Christie MacDonald and Jillian Carter; Paul Landry, Regional Executive Director (back row, left to right), following the regional recognition ceremony held on Wednesday, April 17, 2019. Port Hawkesbury, NS:— Great things are happening in schools throughout the Strait Region. Education Week, April 14 to 20, 2019, provides an opportunity for parents/guardians and the general public to share in celebrating the achievements of students and staff, and to acknowledge the contributions that many people, in supporting roles, make to our public education system. This year’s Education Week theme is Inclusive Education: Helping our Students and Children Succeed. Education Week recognizes educators and school support staff who have gone above and beyond in providing inclusive supports to students, make them feel welcomed, appropriately challenged, and supported in their efforts. Inclusive education learning environments are fostered where individual needs are met and every student and child has an opportunity to succeed. Many of the region's schools are participating in Education Week activities highlighting learning opportunities that are supporting our students’ achievement and success. 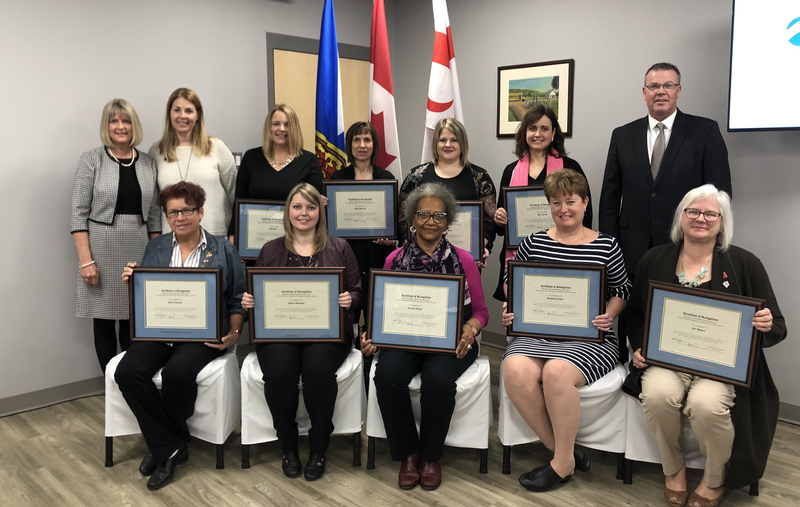 During the Principals’ Meeting scheduled for Wednesday, April 17, 2019, the Strait Regional Centre for Education will also recognize the Award recipients for their significant contributions and leadership. NOTE: Information is attached highlighting the SRCE Recipients of the Education Week 2019 Awards. Jillian is very committed to creating an inclusive and stimulating environment where all children can engage in play-based activities at their own level of development and interest. She works collaboratively with her co-educator, the children, and their families to reflect upon children’s ideas and consider their meaning in the context of the development of the whole child. Jillian has created a high quality pre-primary program that benefits all of the children and their families. She works to ensure children’s interests are demonstrated in such a way that she can tap into what is most important to them. Janice’s kind and caring nature makes her a perfect fit in her career choice. Her hard work and determination help ensure all of her students have opportunities to learn, grow and succeed. In addition to her role as a Teacher Assistant, she has taken on many additional roles to support students outside the classroom, such as coaching multiple sports teams, leading an after-school program four days a week for our elementary First Nations students, and coordinating the school breakfast program where she greets all students each morning, ensuring they have a healthy meal to start the day. Julie demonstrates her passion for teaching every day as she works hard to ensure that her students, especially those with learning challenges, have the supports they need and to create an inclusive learning environment for all her students. She makes incredible strides with her students by utilizing her creativity and positivity. Her students respond, in turn, by demonstrating their joy to be at school. Throughout her career, Donna always went above and beyond for all of her students and colleagues. Students describe Donna as a very trustworthy person and they always feel comfortable talking with her because they know she will listen. More than just a Mi’kmaw Language teacher, Donna works hard to ensure that her classroom is welcoming, responsive and respectful for all students who enter it. Chelsea is a highly respected teacher who treats all students with respect and dignity. While her students have a diverse set of abilities and needs, she consistently acknowledges that all students are capable of growth in their own unique ways. She truly gets to know her students and has an excellent and trusting rapport with them. Chelsea nourishes her students intellectually, socially, emotionally, and is always reflecting upon her own teaching practice. She incorporates a variety of pedagogical tools to achieve her inclusive classroom, including the physical design/layout, the integration of technology, making her room sensory friendly, and creating social opportunities. Christie always considers the needs of her students, whether it is developing individual programming or implementing culturally responsive practices. She is committed to ensuring all of her students are heard and feel included, whether it is by establishing a gay-straight alliance (GSA) committee at the school or revamping the student council to allow for more student voices to be heard. Christie is always willing to go above and beyond for students who are at risk. Regardless of the situation, when asked to help out, her response is always 'I will do whatever needs to be done to help a student succeed'. Lorraine has demonstrated outstanding leadership in supporting African Nova Scotian students within the Strait Regional Centre for Education. Over the years, Lorraine has supported and helped countless students recognize their talents and strengths. She is calm and level headed and works with her students in an empathetic and compassionate way. Her students are receptive to her approach which enables them to strive towards their potential both academically and socially. Through her efforts, Lorraine has helped Dr. John Hugh Gillis Regional High School become more culturally proficient and has provided constructive suggestions to improve the school’s diverse learning environment and help move the school along the path of being more inclusive and welcoming to all staff and students. Annamarie is an instrumental member of the regional Student Services team. She has led teachers in a quest to improve how students with special needs and challenges are taught and supported in public schools. She has also facilitated professional development, helped schools establish programming, and advocated for services and programming in the community when students transition out of public school. Her work with transitioning students into and out of school has put parents at ease, making the path smoother for teachers and administrators to continue their support to students. Ann is a principal committed to ensuring all students thrive and enter a school that is inclusive and welcoming to all learners, as she models both inclusive and culturally responsive practices. Her compassion makes all students feel welcomed, nurtured and challenged to succeed. Ann’s dedication is unsurpassed and her leadership in promoting inclusive educational practices in all classrooms and learning environments she supports is outstanding. She cares deeply about the success of all her students.